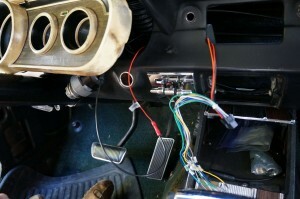 This past weekend, I successfully made all the electrical connections for the radio to function. 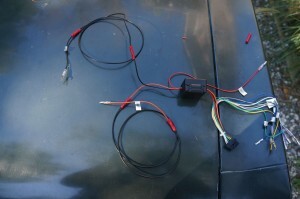 There were three connections that needed to be made between the radio and the car itself – a source of constant power, a source of power when the ignition was turned to “accessory,” and a ground. Each proved to be its own source of complication and frustration. The ignition power was an easy connection, but the wire that was shipped had the wrong end to it. I didn’t want to drill any new holes into the body for the ground, so I found an existing ground screw behind one of the kick-panels and decided to use that. The problem was it was located farther away than the wire could reach, so an extension needed to be made. After finding a source of constant power – something that took too much time itself – it was obvious that the wire would need to be extended as well. A trip to NAPA followed, to pick up wire, an electrical multi-tool, solder-less crimping connectors and ringed wire endings. 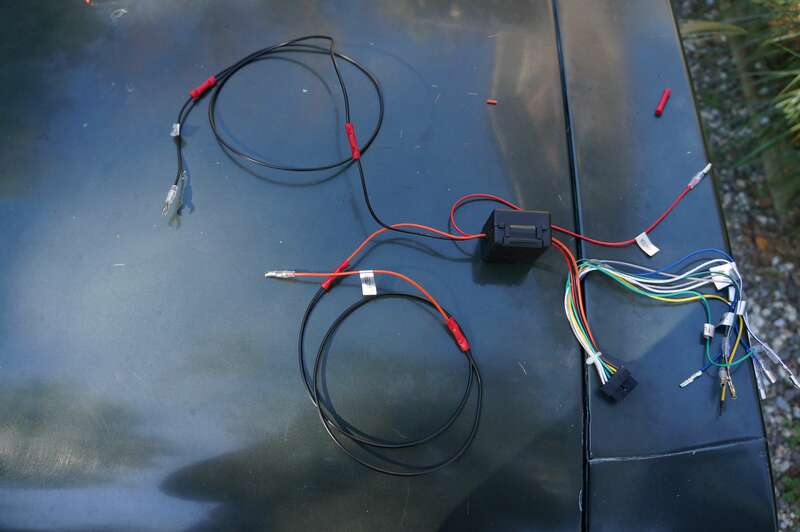 After all the modifications had been made, the wires were ready to be connected to the car. Removing the ignition assembly was the hardest part, as it required twisting and pushing behind the instrument panel in all these awkward ways. Since my speakers had not – and as of this writing still have not – arrived, I tested the radio using a makeshift connection out of one of the pre-amp outputs in the back and a small portable speaker. The connections were made, the car was turned on, and the sounds of Eric Clapton finally came over the small speaker. Success! All that is left to do is mount the radio in the dashboard, and to connect the speakers …. when they arrive. Congratulations, Sam! Sound like you are making great progress! Wish I were close by to see how it is coming, but Eastern NC is a few too many miles away!